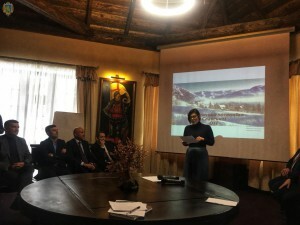 Today, on January 23, Slavske village hosted a second meeting of representatives of territorial communities of neighboring Lviv, Ivano-Frankivsk, and Transcarpathia regions for coordinating the cooperation for development of road and tourist infrastructure, exchanging tourist flows and increasing duration of tourists’ stay in the Carpathians. 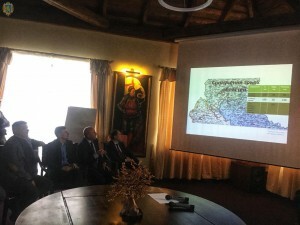 The event welcomed the participation of the First Deputy Head of Lviv State Administration, Rostyslav Zamlynskyi, PLEDDG Project Senior Governance Advisor, Kadie Ward, Director of the Ivano-Frankivsk Tourist Association, Oksana Fedorovych, local government senior officials, experts, and representatives of the business community. “It’s a pleasure to be gathered all together in Slavske amalgamated territorial community. It’s an inspiring region as it inspires us to create and implement a lot of projects. One of the first projects that had been implemented in 2015 at the initiative of the Head of Lviv Regional State Administration, Oleh Syniutka, was a road communicating the Kyiv-Chop motorway to Slavske, with Volosianka. “No community or business development is possible without infrastructure development and road facilities development”, – Rostyslav Zamlynskyi said. Moreover, Rostyslav Zamlynskyi pointed out that for the last four years they had repaired and built 1700 kilometers of roadbed. “We’re proud of having finished revamping one of the secondary schools in Slavske. Now children can go to a modern-looking school. The project was implemented in the framework of the “New Educational Space” Project”. There can be illustrated by a lot of similar cases. Owing to decentralization reform, in particular, the financial one, a lot of funds now remain with local governments and amalgamated territorial communities”, – the First Deputy added. Also, the participants’ attention was drawn to a successful implementation of the EU Sectoral Support Project “VeloCarpathia: Development of Infrastructure for cyclotourism in Lviv region” for 2018-2020. 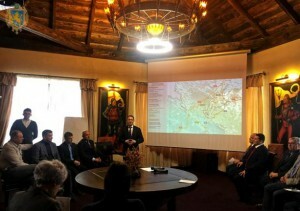 It should be noted that the day before, on December 14, 2018, representatives of local governance of Slavske amalgamated territorial communities of Lviv region, Vyhoda village, and Dolyna town of Ivano-Frankivsk region signed the Memorandum serving as a departure point for cooperation in the area of economic development of those communities and for creation of the sub-regional cluster. Therefore, the communities that signed the Memorandum have potential for tourist development and strive for active developing of recreation infrastructure. Specifically, in the territory of Slavske amalgamated territorial community, it is planned to build a modern European ski resort. Such a powerful tourist center will require a branchy infrastructure of roads, hiking and cycling routes, recreation and health complexes, entertainment industries, etc. The Slavske community has already commenced designing and constructing the road required, which will enable it to have access to the regional road Р-21 “Dolyna-Khust”. 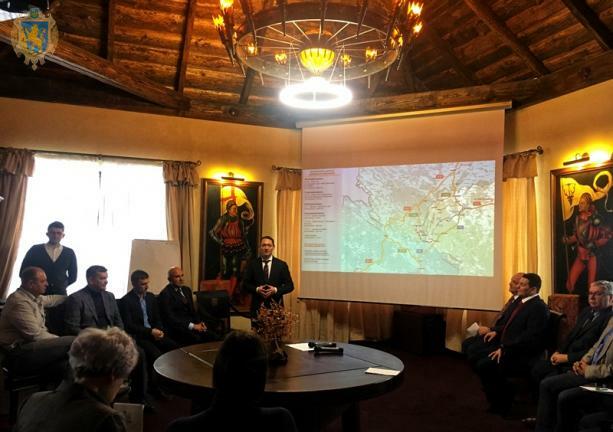 This will facilitate establishing logistic connections with the territories of Dolyna district of Ivano-Frankivsk region and Mizhhirskyi district of Transcarpathia district, which in its turn, will promote development of the tourist sector in the territories of these regions. In the framework of the round-table discussion, issues of the tourist and recreational potential of the sub-region and of each partner community were tackled and further steps of joint activity aimed at promotion of the sub-regional tourist cluster were discussed.